90mm / 33D / 76 kw Extruder - 1 No. 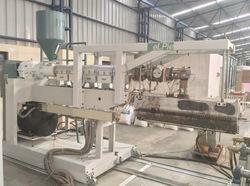 65mm / 30D / 45 kw Extruder - 1 No. Continuous hydraulic screen changers with common power pack - 2 No. Carriage (2 Axis movement ) for Extruder assembly - 1 No. Mounting structure for Die - 1 No. Lamination Assembly - 1 No. Co-extrusion feed block - 1 No. Flat coat hanger die - 1 No. Primary unwinder - 1 No. In-feed unit - 1 No. Coating unit with dryer -1 No. Sandwich unwinder - 1 No. Out-feed unit - 1 No. Rewinding unit - 1 No. Edge trimming unit - 1 No. Control Panel - 1 No. Looking for Extruder coating and lamination machine ?